In November, more than 140 people attended a special PINTS TO PROTECT OUR LAND fundraiser to support the Branford Land Trust. 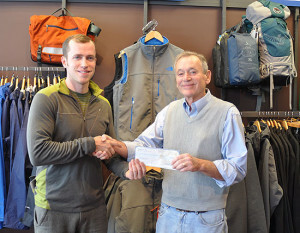 Hosted by Trailblazer and Patagonia, the event raised close to $4,000. Special thanks to DuVig Brewery and G Café Bakery, both of Branford, for providing refreshments for the evening. The donation will be used to support the Land Trust’s ongoing efforts to preserve open space in Branford, and to promote our community’s appreciation of Branford’s diverse natural features. Since 1995, Trailblazer has provided customers with a selection of clothing, footwear and gear from quality outdoor brands. Trailblazer strives to connect with and support the communities in which they do business, and seeks out creative ways to engage with organizations that share the common goal to promote youth and family engagement in the outdoors and to protect access to local green spaces. As a member of the Grassroots Outdoor Alliance, Trailblazer is able to partner with brands such as Patagonia to provide grants and fundraising opportunities within its community.